meat Our fresh meat comes from the Organic Rhug Estate in North Wales. Award winning chicken, also used by Raymond Blanc at Le Manoir, beef from an Aberdeen Angus Herd, tasty Duroc Pork, Salt Marsh lamb and great bacon & sausages. Our organic sliced hams come from 'Dorset Farms' in Littlewindsor, Dorset. They supply us with traditional ham, smoked ham and honeyed ham. Our cold cuts also include Spanish organic pancetta, chorizo and several types of serrano. From Italy we have Prosciutto di san Daniele and Prosciutto de Parma. fish Our fresh fish comes from Cornish Dayboats. We order in the morning, dependent on what's available from that days catch. It is then packed and delivered to us overnight ready for sale the very next day. From the sea to our shelves in 24 hours. 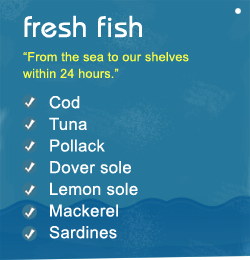 Depending on the time of year this can include cod, tuna, pollack, dover sole, lemon sole, mackerel and sardines. From Scotland, we also receive fresh organic salmon and the highly regarded Loch Duart Salmon. If the seas have been stormy the catch is limited. This is fishing in the traditional way and our customers have come to appreciate that. Apart from our fresh range, we also carry roast trout and oak roasted mackerel from a multi award winning traditional Cornish smokehouse. We sell the Ortiz range of anchovies and tuna alongside the sustainably fished, Fish 4 Ever range. We stock organic smoked salmon from the west coast of Ireland and our locally smoked, smoked salmon comes from a family firm in North London who have been established in the area for over 100 years. For something fishy, tasty and prepared, our fish pies are forever popular.